A conscientious objector (CO) is an –individual [who has] claimed the right to refuse to perform military service" on the grounds of freedom of thought, conscience, or religion. In some countries, conscientious objectors are assigned to an alternative civilian service as a substitute for conscription or military service. Some conscientious objectors consider themselves pacifist, non-interventionist, non-resistant, or antimilitarist. Historically, many conscientious objectors have been executed, imprisoned, or otherwise penalized when their beliefs led to actions conflicting with their society's legal system or government. The legal definition and status of conscientious objection has varied over the years and from nation to nation. Religious beliefs were a starting point in many nations for legally granting conscientious objector status. Acceptable grounds for granting conscientious objector status have broadened in many countries. Conscientious objection and doing civilian service (i.e. civilian tasks as an alternative to compulsory military service) has, in many countries, evolved into a veritable institution. Today in some countries such as Germany and Austria, those who are fulfilling their civilian service in the nursing or social domain bear a huge part of the workload in these areas. Some conscientious objectors served as smoke jumpers and aides in mental institutions in the U.S. during WWII and the Korean War. In 1948, the issue of the right to –conscience– was dealt with by the United Nations General Assembly in Article 18 of the Universal Declaration of Human Rights. 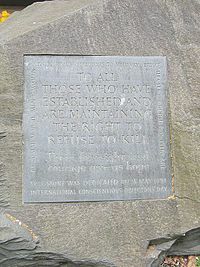 It reads: –Everyone has the right to freedom of thought, conscience and religion; this right includes freedom to change his religion or belief, and freedom, either alone or in community with others and in public or private, to manifest his religion or belief in teaching, practice, worship and observance.– The proclamation was ratified during the General Assembly on 10 December 1948 by a vote of 48 in favour, 0 against, with 8 abstentions. The Nuremberg Principles were a set of guidelines for determining what constitutes a war crime. The document was created by the International Law Commission of the United Nations to recognize the legal principles underlying the Nuremberg Trials of Nazi party members following World War II. Nuremberg Principle IV states: "The fact that a person acted pursuant to order of his Government or of a superior does not relieve him from responsibility under international law, provided a moral choice was in fact possible to him." The reasons for refusing to perform military service are varied. Many conscientious objectors cite religious reasons. Unitarian Universalists object to war in their sixth principle "The goal of world community with peace, liberty and justice for all". Members of the Historic Peace Churches such as Quakers, Mennonites, Amish, and Church of the Brethren object to war from the conviction that Christian life is incompatible with military action, because Jesus enjoins his followers to love their enemies and to refuse violence. Jehovah's Witnesses, while not pacifist in the strict sense, refuse to participate in the armed services on the grounds that they believe they should be neutral in worldly conflicts and often cite the latter portion of Isaiah 2:4 which states, "–neither shall they learn war anymore." Other objections can stem from a deep sense of responsibility toward humanity as a whole, or from simple denial that any government possesses the moral authority to command warlike behavior from its citizens. In the early Christian Church followers of the Christ refused to take up arms. In as much as they [Jesus– teachings] ruled out as illicit all use of violence and injury against others, clearly implied [was] the illegitimacy of participation in war– The early Christians took Jesus at his word, and understood his inculcations of gentleness and non-resistance in their literal sense. They closely identified their religion with peace; they strongly condemned war for the bloodshed which it involved. – The Early Christian Attitude to War. After the Roman Empire officially embraced Christianity, the Just War theory was developed in order to reconcile warfare with Christian belief. After Theodosius I made Christianity an official religion of the Empire, this position slowly developed into the official position of the Western Church. In the 11th century, there was a further shift of opinion in the Latin-Christian tradition with the crusades, strengthening the idea and acceptability of Holy War. Objectors became a minority. Some theologians see the loss of a pacifist position as a great failing of the Church; see Constantinian shift and Christian pacifism. Because of their conscientious objection to participation in military service, whether armed or unarmed, Jehovah's Witnesses have often faced imprisonment or other penalties. In Greece, for example, before the introduction of alternative civilian service in 1997, hundreds of Witnesses were imprisoned, some for three years or even more for their refusal. In Armenia, young Jehovah's Witnesses have been imprisoned (and remain in prison) because of their conscientious objection to military service. The government of South Korea also imprisons hundreds for refusing the draft. In Switzerland, virtually every Jehovah's Witness is exempted from military service. The Finnish government exempts Jehovah's Witnesses from the draft completely. The following is said of the Seventh-day Adventists (SDA) by a neutral, non-SDA organization: "Many Seventh-day Adventists refuse to enter the army as combatants, but participate as medics, ambulance drivers, etc. During World War II in Germany, many SDA conscientious objectors were sent to concentration camps or mental institutions; some were executed. Some Seventh-day Adventists volunteered for the US Army's Operation Whitecoat. The Church preferred to call them "conscientious participants", because they were willing to risk their lives as test subjects in potentially life-threatening research. Over 2,200 Seventh-day Adventists volunteered in experiments involving various infectious agents during the 1950s through the 1970s in Fort Detrick, MD. " A schism arose during and after World War I between Seventh-day Adventists in Germany who agreed to serve in the military if conscripted and those who rejected all participation in warfare – the latter group eventually forming a separate church (the Seventh Day Adventist Reform Movement). For believers in Indian religions, the opposition to warfare may be based on either the general idea of ahimsa, non-violence, or on an explicit prohibition of violence by their religion, e.g., for a Buddhist, one of the five precepts is "Pänätipätä veramaái sikkhäpadam samädiyämi," or "I undertake the precept to refrain from destroying living creatures," which is in obvious opposition to the practice of warfare. The 14th Dalai Lama has stated that war "should be relegated to the dustbin of history." On the other hand, many Buddhist sects, especially in Japan, have been thoroughly militarized, warrior monks (yamabushi or shei) participating in the civil wars. Hindu beliefs do not go against the concept of war, as seen in the Gita. Both Sikhs and Hindus believe war should be a last resort and should be fought to sustain life and morality in society. A notable example of a conscientious objector was the Austrian devout Roman Catholic Christian Franz Jgersttter, who was executed on August 9, 1943 for openly refusing to serve in the Nazi Wehrmacht, consciously accepting the penalty of death. He was declared Blessed by Pope Benedict XVI in 2007 for dying for his beliefs, and is viewed as a symbol of self-sacrificing resistance. On March 8, 1971, the U.S. Supreme Court ruled on the case of Gillette v. United States: The ruling stated, "The exemption for those who oppose "participation in war in any form" applies to those who oppose participating in all war and not to those who object to participation in a particular war only." On September 24, 2003, in Israel, 27 reserve pilots and former pilots, already exempt from reserve duty, refused to serve in only specific missions. These specific missions included "civilian population centers" in "the [occupied] territories." These pilots clarified: "We ... shall continue to serve in the Israel Defense Forces and the Air Force for every mission in defense of the state of Israel." Conscientious objection exists since the incorporation of forced military service but was not officially recognized until the twentieth century, when it was gradually recognized as a fundamental human right as a part of the freedom of conscience. Despite the fact that international institutions like the United Nations (UN) or the Council of Europe (CoE) regard and promote conscientious objection as a human right,  as of 2004[update], it still does not have a legal basis in most countries. Among the roughly one-hundred countries that have conscription, only thirty countries have some legal provisions, 25 of them in Europe. In Europe, most countries with conscription more or less fulfill international guidelines on conscientious objection legislation (except for Greece, Cyprus, Turkey, Finland and Russia) today. In many countries outside Europe, especially in armed conflict areas (Israel, Democratic Republic of the Congo), conscientious objection is punished severely. While conscientious objectors used to be seen as deserters, traitors, cowards, slackers or simply un-patriotic, their image has changed drastically in the Western world in past decades. Especially in Europe, where objectors usually serve an alternative civilian service, they are regarded as making an equally important contribution to society as conscripts. Parallel to that, the number of objectors has risen significantly, too: e.g., in Germany, where conscientious objection is a constitutional right, from less than one percent of all eligible men to more than fifty percent in 2003. John T. Neufeld was a Mennonite World War I conscientious objector sentenced to 15 years hard labor in the military prison at Leavenworth. He was paroled to do dairy work and released after serving five months of his sentence. His diary of army and prison life is published in a collection with three other WWI Mennonite conscientious objectors. During the American Revolutionary War, exemptions varied by state. Pennsylvania required conscientious objectors, who would not join companies of voluntary soldiers called Associations, to pay a fine roughly equal to the time they would have spent in military drill. Quakers who refused this extra tax had their property confiscated. The first conscription in the United States came with the Civil War. Although conscientious objection was not part of the draft law, individuals could provide a substitute or pay $300 to hire one. By 1864 the draft act allowed the $300 to be paid for the benefit of sick and wounded soldiers. Conscientious objectors in Confederate States initially had few options. Responses included moving to northern states, hiding in the mountains, joining the army but refusing to use a weapon or imprisonment. Between late 1862 and 1864 a payment of $500 into the public treasury exempted conscientious objectors from Confederate military duty. –Mennonite from Camp Lee, Virginia, United States, 16 July 1918. In the United States during World War I, conscientious objectors were permitted to serve in noncombatant military roles. About 2000 absolute conscientious objectors refused to cooperate in any way with the military. These men were imprisoned in military facilities such as Fort Lewis (Washington), Alcatraz Island (California) and Fort Leavenworth (Kansas). Some were subjected to treatment such as short rations, solitary confinement and physical abuse severe enough as to cause the deaths of two Hutterite draftees. Describe the nature of your belief which is the basis of your claim. Explain how, when, and from whom or from what source you received the training and acquired the belief which is the basis of your claim. Give the name and present address of the individual upon whom you rely most for religious guidance. Describe the actions and behavior in your life which in your opinion most conspicuously demonstrate the consistency and depth of your religious convictions. Have you ever given public expression, written or oral, to the views herein expressed as the basis for your claim made above? If so, specify when and where. Have you ever been a member of any military organization or establishment? If so, state the name and address of same and give reasons why you became a member. Are you a member of a religious sect or organization? Describe carefully the creed or official statements of said religious sect or organization as it relates to participation in war. Describe your relationships with and activities in all organizations with which you are or have been affiliated other than religious or military. Civilian Public Service (CPS) provided conscientious objectors in the United States an alternative to military service during World War II. From 1941 to 1947 nearly 12,000 draftees, unwilling to do any type of military service, performed work of national importance in 152 CPS camps throughout the United States and Puerto Rico. The work was initially done in areas isolated from the general population both because of the government's concern that pacifist philosophy would spread and conscientious objectors would not be tolerated in neighboring communities. A constant problem through the duration of the program, especially in camps located in national forests for fire control, was make-work projects designed to occupy the men's time in the off-season and between fires. For instance, men at a camp on the Blue Ridge Parkway in Virginia shoveled snow from an unused roadway while a snowplow was parked nearby. The uselessness of this type of work led to low morale and loss of experienced men as they requested transfers to other camps hoping for more meaningful work. Draftees from the historic peace churches and other faiths worked in areas such as soil conservation, forestry, fire fighting, agriculture, social services, and mental health. The CPS men served without wages and minimal support from the federal government. The cost of maintaining the CPS camps and providing for the needs of the men was the responsibility of their congregations and families. CPS men served longer than regular draftees, not being released until well past the end of the war. Initially skeptical of the program, government agencies learned to appreciate the men's service and requested more workers from the program. CPS made significant contributions to forest fire prevention, erosion and flood control, medical science and especially in revolutionizing of the state-run mental health institutions which had previously been very inhumane and often cruel. Alternatives to war bonds and war savings stamps were provided for those who would not fund the war for conscientious reasons. National Service Board for Religious Objectors offered civilian bonds and Mennonite Central Committee offered Civilian Public Service stamps and War Sufferers' Relief stamps. Civilian Public Service was disbanded in 1947. By the early 1950s a replacement program, 1-W service, was in place for conscientious objectors classified as 1-W by Selective Service. The new program eliminated the base camps of CPS and provided wages for the men. 1-W service was divided into several categories. The Earning Service involved working in institutions such as hospitals for fairly good wages. Voluntary Service was nonpaying work done in similar institutions, mostly within North America. Pax Service was a nonpaying alternative with assignments overseas. 1-W Mission Supporting Service was like the Earning Service but the wages were used for the support of mission, relief or service projects of the draftees choice. The nonpaying services were promoted by church agencies as a sacrifice to enhance the peace witness of conscientious objectors. War will exist until the distant day when the conscientious objector enjoys the same reputation and prestige as the warrior does today. A 1971 United States Supreme Court decision, Gillette v. United States, broadened U.S. rules beyond religious belief but denied the inclusion of objections to specific wars as grounds for conscientious objection. Currently, the U.S. Selective Service System states, "Beliefs which qualify a registrant for conscientious objector status may be religious in nature, but don't have to be. Beliefs may be moral or ethical; however, a man's reasons for not wanting to participate in a war must not be based on politics, expediency, or self-interest. In general, the man's lifestyle prior to making his claim must reflect his current claims." In the US, this applies to primary claims, that is, those filed on initial SSS registration. On the other hand, those who apply after either having registered without filing, and/or having attempted or effected a deferral, are specifically required to demonstrate a discrete and documented change in belief, including a precipitant, that converted a non-CO to a CO. The male reference is due to the current "male only" basis for conscription in the United States. In the United States, there are two main criteria for classification as a conscientious objector. First, the objector must be opposed to war in any form, Gillette v. United States, 401 U.S. 437. Second, the objection must be sincere, Witmer v. United States, 348 U.S. 375. That he must show that this opposition is based upon religious training and belief was no longer a criterion after cases broadened it to include non-religious moral belief, United States v. Seeger, 380 U.S. 163 and Welsh v. United States, 398 U.S. 333. COs willing to perform non-combatant military functions are classed 1-A-O by the U.S.; those unwilling to serve at all are 1-O. Pursuant to the Treaty between the Government of Canada and the Government of the United States of America on Mutual Legal Assistance in Criminal Matters, US authorities can request Canadian authorities to identify, locate, and take into custody US nationals who have committed a crime that carries a possible sentence of more than a year, and subsequently extradite the target back to the US, as per the Extradition Treaty Between the United States of America and Canada. However, the US government must promise that those extradited will not receive the death penalty, in accordance with the Supreme Court of Canada ruling in United States v. Burns. Thus, deserters who may have had an arrest warrant issued against them in the US are liable for arrest in Canada, unless they legalise their status, which can be done by pursuing a refugee claim, which the Immigration and Refugee Board of Canada (IRB) will consider. If the claim is refused, the claimant can appeal the decision in the Federal Court, the Federal Court of Appeal, and finally, the Supreme Court of Canada, if leave is granted. If, however, appeals do not overturn the decision of the IRB, the claimant must leave Canada within 30 days, if given a removal order. If this is not done, or departure details are not confirmed with the Canada Border Services Agency, a deportation order is issued, enforceable by any officer of the Queen's peace in Canada. From the mid 1960s to the mid 1970s, there was multi-faceted relationship between Canada and the Vietnam War. Starting in 1965, Canada became a choice haven for American draft resisters and deserters. Because they were not formally classified as refugees but were admitted as immigrants, there is no official estimate of how many draft resisters and deserters were admitted to Canada during the Vietnam War. One informed estimate puts their number between 30,000 and 40,000. Whether or not this estimate is accurate, the fact remains that immigration from the United States was high as long as the war raged and that in 1971 and 1972 Canada received more immigrants from the United States than from any other country. Although some of these transplanted Americans returned home after the Vietnam War, most of them put down roots in Canada, making up the largest, best-educated group Canada had ever received. Draft resistors were usually college-educated sons of the middle class who could no longer defer induction into the Selective Service System. The Canadian government initially refused to admit those who could not prove that they had been discharged from [American] military service. This changed in 1968. Noteworthy draft resisters include Jim Green (Vancouver city councillor and mayoral candidate), Eric Nagler, and Jesse Winchester. Distinct from draft resisters, there are also noteworthy deserters from that era, which include Andy Barrie (Host of Canadian Broadcasting Corporation Radio's Metro Morning), and Jack Todd (award-winning sports columnist for the Montreal Gazette). In the years following the 2003 invasion of Iraq, there was a multi-faceted relationship between Canada and Iraq War Resisters. On June 3, 2008 and March 30, 2009, two motions were passed in the Parliament of Canada in support of the war resisters' efforts to stay in Canada. An Angus Reid Strategies poll taken on June 6 and 7, 2008, showed that 64% of Canadians agreed with that motion. But the motions' recommendation was non-binding and was never implemented by the minority Conservative government. The significance of this issue on Canada's historical international reputation as a place of refuge is illustrated by this quote from United Kingdom's media, the BBC, when they reported on the precedent-setting case of Iraq war resister Jeremy Hinzman in 2004: "Americans in trouble have been running to Canada for centuries– in the wake of the American Revolution– [in the] Underground Railroad that spirited escaped American slaves to freedom– and in the 1960s, [when] as many as 60,000 young American men dodged the draft–"
After Canada deported several of these war resisters in 2008 and 2009, and after they were imprisoned in the US, the US media Newsweek reported on this historical shift. As of July 2009, there were at least 28 public cases of U.S. war resisters in Canada, plus some families. When they first arrived in Canada, they mostly went to Toronto, Ontario; or Vancouver, British Columbia because that is where the majority of the organizing of the War Resisters Support Campaign takes place. There is also an unknown number of US soldiers who have refused to participate in specifically the Iraq war, have come to Canada without going public, and have not applied for legal refugee status. Daniel Sandate was one of those. All political parties, except the governing minority Conservative Party of Canada, voted twice (in party voting blocs) in favor of allowing Iraq war resisters to remain in Canada. Mennonites in Canada were automatically exempt from any type of service during World War I by provisions of the Order in Council of 1873. With pressure of public opinion, the Canadian government barred entry of additional Mennonite and Hutterite immigrants, rescinding the privileges of the Order in Council. During World War II, Canadian conscientious objectors were given the options of noncombatant military service, serving in the medical or dental corps under military control or working in parks and on roads under civilian supervision. Over 95% chose the latter and were placed in Alternative Service camps. Initially the men worked on road building, forestry and firefighting projects. After May 1943, as the labour shortage developed within the nation and another Conscription Crisis burgeoned, men were shifted into agriculture, education and industry. The 10,700 Canadian objectors were mostly Mennonites (63%) and Dukhobors (20%). Tsarist Russia allowed Russian Mennonites to run and maintain forestry service units in South Russia in lieu of their military obligation. The program was under church control from 1881 through 1918, reaching a peak of seven thousand conscientious objectors during World War I. An additional five thousand Mennonites formed complete hospital units and transport wounded from the battlefield to Moscow and Ekaterinoslav hospitals. After the Russian Revolution of 1917, Leon Trotsky issued a decree allowing alternative service for religious objectors whose sincerity was determined upon examination. Vladimir Chertkov, a follower of Leo Tolstoy, chaired the United Council of Religious Fellowships and Groups, which successfully freed 8000 conscientious objectors from military service during the Russian Civil War. The law was not applied uniformly and hundreds of objectors were imprisoned and over 200 were executed. The United Council was forced to cease activity in December 1920, but alternative service was available under the New Economic Policy until it was abolished in 1936. Unlike the earlier forestry and hospital service, later conscientious objectors were classified "enemies of the people" and their alternate service was performed in remote areas in a gulag-like environment in order to break their resistance and encourage enlistment. After World War II, conscientious objectors in the Soviet Union and the German Democratic Republic were typically assigned to construction units, in the absence of a fully civilian alternative to military service. The country recognized the right not to fight in the 18th century following problems with attempting to force Quakers into military service. The Militia Ballot Act of 1757 allowed Quakers to be excluded from military service. It then ceased to be a major issue, since Britain's armed forces were generally all-volunteer. However, press gangs were used to beef up army and navy rolls on occasions from the sixteenth to the early nineteenth centuries. Pressed men did have the right of appeal, in the case of sailors, to the Admiralty. The Royal Navy last took pressed men in the Napoleonic War. A more general right to refuse military service was not introduced until during World War I, when Britain introduced conscription with the Military Service Act of March 1916. The Act allowed for objectors to be absolutely exempted, to perform alternative civilian service, or to serve as a non-combatant in the army, according to the extent to which they could convince a Military Service Tribunal of the quality of their objection. Around 16,000 men were recorded as conscientious objectors, with Quakers, traditionally pacifist, playing a large role: 4500 objectors were sent to do 'work of national importance' such as farming, 7000 were ordered non-combatant duties, but 6000 were forced into the army, and when they refused orders, they were sent to prison; thirty-five were taken to France and formally sentenced to death but immediately reprieved to 10 years in prison; conditions were made very hard for conscientious objector prisoners – ten died in prison, and around seventy died elsewhere as a result of their treatment. Many objectors accepted non-combat service, for example working in the dangerous role of stretcher-bearers. Conscientious objectors who were deemed not to have made any useful contribution were disenfranchised for five years after the war, but there was no administrative machinery to enforce such disenfranchisement. Britain's 1916 conscription legislation did not apply to Ireland, despite its then status as part of the United Kingdom; but see Conscription Crisis of 1918. British conscription in World War II also did not apply to Northern Ireland, or to the Irish Free State. Nevertheless, many Irishmen volunteered to fight in both world wars. The various parts of the British Empire and Commonwealth had their own laws: in general, all the larger countries of the Empire participated, and some were, in proportion to their population, major participants. "Come now... You're a Christian, aren't you? There's nothing in the Christian religion which prevents lawful killing in the service of your country." "I haven't got any religion very much, not religion in your sense. But you talk about Christianity, the religion of Christ. Well, I can't imagine Jesus Christ taking a bayonet in His hands and sticking it into the stomach of a German soldier or an English soldier either for that matter. I can't imagine Jesus Christ sitting behind an English machine gun or a German machine gun mowing down dozens of perfectly guiltless men." He goes to jail, as do others with a more conventionally religious view. This is described as one of the harsher tribunals, but within the range of actual events. The CO's cited stance is clearly derived from a well-known and frequently reprinted WW1 article by Dr Alfred Salter, The Religion of a Conscientious Objector, positing the incongruity of "Christ in khaki" with a bayonet. In World War II, following the National Service (Armed Forces) Act of 1939, there were nearly 60,000 registered Conscientious Objectors. Testing by Conscientious Objection Tribunals resumed, this time chaired by a judge, but was much less harsh; if you were not a member of the Quakers or some similar pacifist church, it was generally enough to say that you objected to "warfare as a means of settling international disputes," a phrase from the Kellogg-Briand Pact of 1928. The tribunals could grant full exemption, exemption conditional on alternative service, exemption only from combatant duties, or dismiss the application. Of the 61,000 only 3,000 were given complete exemption and 18,000 were dismissed as false claimants. Of those directed to non-combatant military service almost 7000 were allocated to the Non-Combatant Corps, set up in mid-1940; its companies worked in clothing and food stores, in transport, or any military project not requiring the handling of "material of an aggressive nature". In November 1940 it was decided to allow troops in the NCC to volunteer for work in bomb disposal. In total over 350 volunteered. . Other non-combatants worked in the Royal Army Medical Corps. Other acceptable occupations were farm work, mining, firefighting, ambulance service. About 5500 objectors were imprisoned, charged with offences relating to their unrecognised objection. A further 1000 were court-martialled by the armed forces and sent to military detention barracks or civil prisons. Nevertheless, the social stigma attached to 'conchies' (as they were called) was considerable: regardless of the genuineness of their motives, cowardice was often imputed. Britain retained conscription, with rights of conscientious objection, as National Service until 1960. The use of only volunteer soldiers was hoped to remove the need to consider conscientious objectors. Ever since World War I, however, there have been volunteer members of the armed forces who have developed a conscientious objection to continuing in service; a procedure was devised for them in World War II, and, with adaptations, it continues to this day. According to Article 4(3) of the German constitution (Grundgesetz): "No person shall be compelled against his conscience to render military service involving the use of arms. Details shall be regulated by a federal law." According to Article 12a, every adult male is obligated to military service called Wehrdienst. The draftee can apply for an alternative service called "Zivildienst" (civilian service), if he declares conscience reasons. The civil service may not last longer than military service. This rule has been applied since October 1, 2004. Before that date the civilian service was longer than military service, because soldiers could later be called to military exercises (Wehrbungen). In wartime, civilian draftees are expected to replace those on active military duty in their civilian professions. According to the German constitution, no one may be forced into military service. The Wehrdienst is getting increasingly controversial, because only young men are getting drafted which some consider a violation of the third article of the constitution, that every person is equal before the law, but women are not affected by the Wehrdienst. However, the German constitution also states in Article 12a section 4 that no woman may be forced to serve in the armed forces. Therefore the different treatment of men and women actually has a constitutional basis. Until 2004 conscription was mandatory to all able-bodied Italian males. Those who were born in the last months of the year typically used to serve in the Navy, unless judged unable for ship service (in this case they could be sent back to Army or Air Force). Until 1972, objectors were considered as traitors and tried by a military tribunal. Since 1972, objectors could choose an alternative civilian service, which was eight months longer than standard military service (fifteen months, then twelve, as for Army and Air Force, 24 months, then eighteen, then twelve as for the Navy). Since such length was judged too punitive, an arrangement was made to make the civilian service as long as the military service. Since 2004, Italian males no longer need to object because military service has been turned into volunteer for both males and females. After their service, objectors are not allowed to take jobs that require them to carry weapons, such as police jobs. Since conscription was suspended in 1994 and military service is voluntary, the status of conscience objector can not be granted anymore in Belgium. Women could not get this status either. The Spanish Constitution of 1978 acknowledged conscientious objectors. The Spanish parliament established a longer service (Prestacin Social Sustitutoria) as an alternative to the Army. In spite of this, a strong movement appeared that refused both services. The Red Cross was the only important organisation employing objectors. Because of this, the waiting lists for the PSS were long, especially in areas like Navarre, where pacifism, Basque nationalism and a low unemployment rate discouraged young males from the army. Thousands of insumisos (non-submittants) publicly refused the PSS, and hundreds were imprisoned. In addition a number of those in the military decided to refuse further duties. A number of people not liable for military service made declarations of self-incrimination, stating that they had encouraged insumisin. The government, fearing popular reaction, reduced the length of service and instead of sentencing insumisos to prison declared them unfit for public service. During the 1980s, hundreds of South African white males dodged the draft, refused the call-up or objected to conscription in the South African Defence Force. Some simply deserted, or joined organisations such as the End Conscription Campaign, an anti-war movement banned in 1988, while others fled into exile and joined the Committee on South African War Resistance. Most lived in a state of internal exile, forced to go underground within the borders of the country until a moratorium on conscription was declared in 1993. Opposition to the Angolan War, "South Africa's Vietnam," was rife in English-speaking campuses, and later the war in the townships became the focus of these groupings. The issue is highly controversial in Turkey. Turkey and Azerbaijan are the only two countries refusing to recognise conscientious objection and sustain their membership in the Council of Europe. In January 2006, the European Court of Human Rights (ECHR) found Turkey had violated article 3 of the European Convention on Human Rights (prohibition of degrading treatment) in a case dealing the conscientious objection of Osman Murat Ulke. In 2005, Mehmet Tarhan was sentenced to four years in a military prison as a conscientious objector (he was unexpectedly released in March 2006). Journalist Perihan Magden was tried by a Turkish court for supporting Tarhan and advocating conscientious objection as a human right; but later, she was acquitted. As of August 2008, there are 69 objectors, 13 of which are female. Nowadays B. Kaan Kavlak is the last conscientious objector of Turkey. He declared his objection on May 29 2009. Israel has a history of individuals and groups refusing military service. Such acts are recorded since the state's foundation in 1948, but during the country's first decades involved mainly a few isolated individuals, usually of a pacifist persuasion, due to pervasive public feeling that the country was fighting for its survival and that the IDF was a "Defense Force" in fact as well as in name. Some left-wingers, especially communists, refused to take part in the 1956 Sinai War, which they perceived as an Israeli alliance with a last effort by Britain and France to keep a colonial hold over Egypt , but this remained a small-scale, isolated phenomenon. The war in Lebanon in 1982 precipitated a mass anti-war movement of which a major component was an organised movement by thousands of soldiers (especially reserve soldiers) refusing service in Lebanon. This movement was continued during the First Intifada, the Second Intifada and the Second Lebanon War of 2006. While some of the individuals and groups involved fit with the definition of conscientious objection common in other countries, the phenomenon of "selective refusal," soldiers who remain in the army but refuse particular orders or postings, especially to the Occupied Territories, seems more widespread in Israel than anywhere else. The Israeli High Court of Justice ruled in 2002 that refusal to serve was legal on the grounds of unqualified pacifism, but "selective refusal" which accepted some duties and not others was illegal. The court also said that the refusal to serve in the territories is not conscientious objection. Nevertheless, a debate continues on whether "selective refusal" constitutes conscientious objection in a strict sense or should be treated as a separate phenomenon. On the other hand, some soldiers refused to participate in the eviction of Jewish settlers as part of the Disengagement, believing it to be an act against their own country, and in the immorality of evicting peaceful citizens from their homes. Since the establishment of the Republic of Korea, thousands of conscientious objectors had no choice but to be imprisoned as criminals. Every year about 500 young men, especially Jehovah's Witnesses, are arrested for refusing the draft. In September 2007 the South Korea government announced a program to give conscientious objectors an opportunity to participate in alternative civilian service. The program stipulates three years of civilian service that is not connected with the military in any way. Changes in legislation will first be needed to implement the program. As of May 2010, no such changes have been implemented. On January 15, 2009, the Korean Presidential Commission on Suspicious Deaths in the Military released its decision acknowledging that the Korean government was responsible for the deaths of five young men who were Jehovah–s Witnesses, and were forcibly conscripted into the army. The deaths resulted from –the state's anti-human rights violence– and –its acts of brutality– during the 1970s that continued into the mid-1980s. This decision is significant since it is the first one recognizing the state–s responsibility for deaths resulting from violence within the military. The Korean government–s National Action Plan for the Promotion and Protection of Human Rights (NAP) has not shown a clear stance on the pressing human rights issues such as the National Security Act, the death penalty and the rights of conscientious objectors to military service. In 1990 the Republic of Korea ratified a UN treaty, the International Covenant on Civil and Political Rights, which safeguards the freedoms of thought, conscience, and religion for all people. The Korean Military Service Act, therefore, clearly infringes on constitutional rights–a direct violation of such international standards that honor the right of people to conscientiously object to mandatory military service. "Conscientious objectors ... often spend the rest of their lives tainted by their decision... Criminal records from draft dodging make it difficult for objectors to find good jobs and the issue of army service is often raised by potential employers during job interviews." The records of conscientious objectors to military service are kept by a Korean investigative body as criminal files for five years. As a consequence, conscientious objectors are not allowed to enter a government office and apply for any type of national certification exam, it is also very unlikely that they will be employed by any company that inquires about criminal records. From 2000 to 2008, Korean Military Manpower Administration said that at least 4,958 men have objected to serve the military because of religious beliefs. Among those, 4,925 were Jehovah's Witnesses and three were Buddhists. Another 30 refused the mandatory service because of conscientious objections other than religious reasons. As of 2005, conscientious objectors in several countries may serve as field paramedics in the army (although some do not consider this a genuine alternative, as they feel it merely helps to make war more humane instead of preventing it). Alternatively, they may serve without arms, although this, too, has its problems. In certain European countries such as Austria, Germany, Greece and Switzerland, there is the option of performing Civilian Service, subject to the review of a written application or after a hearing about the state of conscience (see below). In Greece, Civilian Service is twice as long as the corresponding military service and in Switzerland, the Civilian Service is one and one-half times longer. In 2005, the Swiss parliament considered whether willingness to serve one and a half times longer than an army recruit was sufficient proof of sincerity, citing that the cost of judging the state of conscience of a few thousand men per year was too great. In the United States, military personnel who come to a conviction of conscientious objection during their tour of duty must appear in front of a panel of experts, which consists of psychiatrists, military chaplains and officers. In Switzerland, the panel consists entirely of civilians, and military personnel have no authority whatsoever. In Germany, objections to military service are filed in writing, and an oral hearing is scheduled only if the written testimonials have been unconvincing; in practice, due to the heavy workload–about half of all draftees in a given year file as conscientious objectors–the competent authority reviews written applications only summarily, and it denies the alternative of a civilian service only in cases of grave shortcomings or inconsistencies in the written testimonials. Commonly, once an objector is summoned to a hearing, he has to explain what experiences drove him to recognize a conflict concerning his conscience. Are you merely a leader, a follower or a loner? These are common questions from Swiss hearings. By and large, these are asked in many other countries. They help to determine if the objector is politically motivated or if he is just too lazy to serve the country; or if he truly has a conflict stemming from his conscience. Arguments like "The army is senseless," "It is not just to wage wars," or opposition to involvement in a specific war (World War II, the Vietnam War, the Iraq War; a hypothetical war of West Germany against fellow Germans from the GDR during the Cold War) will hardly ever be accepted. He has only, and convincingly, to show that his conscience does not allow participation in an organisation which is intended to use violence. In hearings about one's personal conflicts of conscience, certain subtleties may arise. One example from interrogations in Germany is about a plank of wood floating on the sea, and you, shipwrecked, need cling to it in order to save your life. Another person swims nearby and he also is in need of this plank. If you deny him the plank, you are, according to the interrogators ready to accept the death of a fellow human being, and therefore able to serve in the military. Otherwise, if you are willing to allow the other person use of the plank you are willing to die and therefore not credible. In other examples, the interviewers would ask if one was ready to kill in self-defense or in the defense of a friend or family member or why one had not revoked their driver's license, for driving carries a risk of accidentally killing someone. In Britain during World War I, there was an argument put forth by a conscientious objector of note[who?]. He asked the people who were part of the tribunal if they were Christian, when they all replied in the positive he then remarked, "Could you imagine Christ in khaki running out into no-mans land?" None of the panelists could, and the man was given total exemption due to 'religious beliefs'. In various places, questions about such hypothetical situations have come into disuse because they do not explore the present-day state of the objector's conflict of conscience, but possible future actions which, with a great probability, will never take place. In the 1980s, these types of questions were abolished in Germany after the Federal Constitutional Court found them unconstitutional. Similar hearings and questions about hypothetical situations were in use in Finland for most of the history of Finnish conscientious objection, from its introduction in the 1930s to the 1980s, when they were abolished. Today, draftees have to specify whether they are objecting for religious or ethical reasons by marking the appropriate checkbox on a form, but hearings are no longer held. If conscripts turn into conscientious objectors during their service, the Defense Force will inquire of their reasons for internal research purposes, but the objectors are not required to answer unless they wish to do so. Usually, a conscientious objector will be released from the military within a few hours of making the claim. ^ On July 30, 1993, explicit clarification of the International Covenant on Civil and Political Rights Article 18 was made in the United Nations Human Rights Committee general comment 22, Para. 11: "Special Rapporteur on freedom of religion or belief. Framework for communications. Conscientious Objection". Office of the United Nations High Commissioner for Human Rights. http://www2.ohchr.org/english/issues/religion/I3k.htm. Retrieved 2008-05-15. ^ "International Covenant on Civil and Political Rights; See Article 18". Office of the United Nations High Commissioner for Human Rights. http://www2.ohchr.org/english/law/ccpr.htm. Retrieved 2008-05-15. ^ UN Commission on Human Rights (March 8, 1995). "UN Commission on Human Rights, Conscientious objection to military service., 8 March 1995, E/CN.4/RES/1995/83 (See point #2)". UN Commission on Human Rights. http://www.unhcr.org/refworld/topic,4565c22523,4565c25f2c9,3b00f0d220,0.html. Retrieved 2009-12-02. ^ United Nations High Commissioner for Human Rights (April 22, 1998). "Conscientious objection to military service; Commission on Human Rights resolution 1998/77; see preamble "Aware..."". United Nations High Commissioner for Human Rights. http://www.unhchr.ch/Huridocda/Huridoca.nsf/0/5bc5759a53f36ab380256671004b643a?Opendocument. Retrieved 2009-12-08. ^ "Conscientious objection to military service; E/CN.4/RES/1998/77; See introductory paragraph". UN Commission on Human Rights. April 22, 1998. http://www.unhcr.org/cgi-bin/texis/vtx/refworld/rwmain?page=search&docid=3b00f0be10&skip=0&query=1998/77. Retrieved 2009-12-09. ^ "Conscientious objection to military service, Commission on Human Rights resolution 1998/77, Navigation to document: press –next– four times, see bottom listing, and at the right choose letter for language (–E– for English) Document: CHR 54th 4/22/1998E/CN.4/RES/1998/77". United Nations Human Rights, Office of the High Commissioner for Human Rights. 1998. http://ap.ohchr.org/documents/sdpage_e.aspx?b=1&se=10&t=11. Retrieved 2008-04-24. ^ D. CHRISTOPHER DECKER, AND LUCIA FRESA (29-MAR-2001). "THE STATUS OF CONSCIENTIOUS OBJECTION UNDER ARTICLE 4 OF THE EUROPEAN CONVENTION ON HUMAN RIGHTS, 33 N.Y.U. J. INT–L L. & POL. 379 (2000); See pages 412-424, (or PDF pages 34-36)". New York University School of Law, Issues - Volume 33. http://www1.law.nyu.edu/journals/jilp/issues/33/pdf/33n.pdf. Retrieved 2009-12-02. ^ See http://www.unac.org/rights/question.html under "Who are the signatories of the Declaration?" ^ "The Imperatives of Survival". Nobel Foundation. 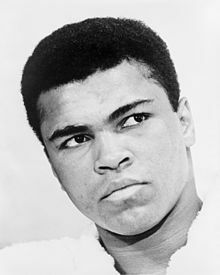 1974. http://nobelprize.org/nobel_prizes/peace/laureates/1974/macbride-lecture.html. Retrieved 2008-04-30. ^ >"International Covenant on Civil and Political Rights". Office of the United Nations High Commissioner for Human Rights. http://www2.ohchr.org/english/law/ccpr.htm. Retrieved 2008-05-15. ^ "A Conscientious Objector's Guide to the UN Human Rights System". War Resisters International. http://www.wri-irg.org/books/co-guide-un.htm. Retrieved 2008-04-30. ^ "Special Rapporteur on freedom of religion or belief. Framework for communications. Conscientious Objection". Office of the United Nations High Commissioner for Human Rights. http://www2.ohchr.org/english/issues/religion/I3k.htm. Retrieved 2008-05-15. ^ "Out of the margins: the right to conscientious objection to military service in Europe". Amnesty International. 1997. http://asiapacific.amnesty.org/library/Index/ENGEUR010041997?open&of=ENG-2EU. Retrieved 2008-04-30. ^ "Conscientious objection to military service; E/CN.4/RES/1998/77; See Point #5". UN Commission on Human Rights. April 22, 1998. http://www.unhcr.org/refworld/docid/3b00f0be10.html. Retrieved 2009-12-09. ^ United Nations High Commissioner for Human Rights (April 22, 1998). "Conscientious objection to military service; Commission on Human Rights resolution 1998/77; see point *7". United Nations High Commissioner for Human Rights. http://www.unhchr.ch/Huridocda/Huridoca.nsf/0/5bc5759a53f36ab380256671004b643a?Opendocument. Retrieved 2009-12-08. ^ "The Seventh-day Adventist Church: Controversies, books and other resources", religioustolerance.org, Ontario Consultants on Religious Tolerance. ^ "Origin of the Seventh Day Adventist Reform Movement". ^ Murray, John Courtney (1967-06-04). "Selective Conscientious Objection; Editor Note: An address given at Western Maryland College, June 4, 1967. First published as pamphlet entitled "Selective Conscientious Objection" by Our Sunday Visitor (Huntinton, IN: Our Sunday Visitor, Inc.). Republished as "War and Conscience" in A Conflict of Loyalties: The Case for Selective Conscientious Objected, 19–30, ed. by James Finn, (New York: Gegasus, 1968).". Woodstock Theological Center. http://woodstock.georgetown.edu/library/Murray/1967L.htm. ^ The Nation (Online: September 23, 2003; Print: October 13, 2003). "In Fact... (THE ISRAELI PEACE MOVEMENT TAKES FLIGHT)". The Nation. http://www.thenation.com/doc/20031013/infact. Retrieved 2010-01-11. ^ Random, Jack (May 25, 2005). "Just Say No: The Case for Selective Conscientious Objection". http://www.buzzle.com/editorials/5-25-2005-70478.asp. Retrieved 26 January 2009. ^ D. CHRISTOPHER DECKER, AND LUCIA FRESA (29-MAR-2001). "THE STATUS OF CONSCIENTIOUS OBJECTION UNDER ARTICLE 4 OF THE EUROPEAN CONVENTION ON HUMAN RIGHTS, 33 N.Y.U. J. INT–L L. & POL. 379 (2000)". New York University School of Law, Issues - Volume 33. http://www1.law.nyu.edu/journals/jilp/issues/33/pdf/33n.pdf. Retrieved 2009-12-02. ^ "John F. Kennedy Presidential Library & Museum, Historical Resources, Archives, Reference Desk, Quotations of John F. Kennedy". John F. Kennedy Presidential Library & Museum. http://www.jfklibrary.org/Historical+Resources/Archives/Reference+Desk/Quotations+of+John+F+Kennedy.htm. Retrieved 2008-11-21. ^ Safire, William (2007-08-26). "ON LANGUAGE; Warrior". The New York Times, Magazine. http://query.nytimes.com/gst/fullpage.html?res=9A06E0D61230F935A1575BC0A9619C8B63&sec=&spon=&pagewanted=all. ^ Gillette v. United States, 401 U.S. 437 (1971). ^ Government of Canada (2002). You Asked about– immigration and citizenship. Queen's Printer for Canada. pp. 66. ISBN 0662666798. ^ "Vietnam War Resisters, Then and Now". http://www.letthemstay.ca/english_index.htm. Retrieved 2009-05-24. ^ Canseco, Mario (June 27, 2008). "Angus Reid Poll: Most Canadians Would Grant Permanent Residence to U.S. Military Deserters". Angus Reid. http://www.angusreidstrategies.com/polls-analysis/opinion-polls/angus-reid-poll-most-canadians-would-grant-permanent-residence-us-milit. Retrieved 12 July 2009. ^ Bailey, Sue (July 5, 2009). "Federal website changes undermine Iraq resisters: critics". The Canadian Press. http://www.google.com/hostednews/canadianpress/article/ALeqM5iGSn-j73WQhIktgHT2tLCndsL_5A. Retrieved 17 July 2009. ^ Cooper, Alex (April 21, 2009). "Federal court to hear American war resister's appeal". The Toronto Star. http://www.thestar.com/article/622278. Retrieved 31 July 2009. ^ Gray, Jeff (July 6, 2004). "US deserter's Canadian campaign". BBC. http://news.bbc.co.uk/2/hi/americas/3867481.stm. Retrieved 31 July 2009. ^ Kovach, Gretel (June 6, 2009). "Canada–s New Leaf: America's war deserters could always take comfort in Canada. Now, it's the country that's deserting them.". Newsweek. http://www.newsweek.com/id/200860. Retrieved 14 July 2009. ^ a b "BILL C-440,". House of Commons of Canada. September 17, 2009. http://www2.parl.gc.ca/HousePublications/Publication.aspx?Docid=4104737&file=4. Retrieved 19 September 2009. ^ "40th PARLIAMENT, 2nd SESSION, EDITED HANSARD – NUMBER 083, Thursday, September 17, 2009". Hansard: House Publications. September 17, 2009. http://www2.parl.gc.ca/HousePublications/Publication.aspx?DocId=4107004&Language=E&Mode=1&Parl=40&Ses=2#SOB-2862779. Retrieved 19 September 2009. ^ War Resisters Support Campaign (April 22, 2010). "Website: "Support Bill C-440" - Background". War Resisters Support Campaign. http://letthemstay.ca/. Retrieved May 1, 2010. ^ "Liberal MP introduces war resisters bill". The Toronto Star. September 17, 2009. http://www.thestar.com/news/canada/article/697332. Retrieved 19 September 2009. ^ Peter Dueck, Conrad Stoesz, Grant Klassen, Lynette Wiebe, Elsie Rempel, Lawrence Klippenstein, Alf Redekopp, Dan Dyck, John C. Klassen, Grant Klassen, Edward Enns, Jake K. Wiens, David Schroeder. "Alternative Service in the Second World War: Conscientious Objectors in Canada: 1939 - 1945". http://www.alternativeservice.ca/credits/index.htm. Retrieved 2009-04-27. ^ Braun, Abraham, Th. Block and Lawrence Klippenstein (1989). "Forsteidienst, Global Anabaptist Mennonite Encyclopedia Online". http://www.gameo.org/encyclopedia/contents/F6717ME.html. Retrieved 2006-11-07. ^ a b Jappy, M.J (2001). Danger UXB The Remarkable Story of the Disposal of Unexploded Bombs During the Second World War. Channel 4 books. p. 92. ISBN 0752219383. ^ "Chamber Judgement Ulke vs. Turkey" , Accessed June 7, 2006. ^ Beratungsstelle fr Militrverweigerung und Zivildienst. ^ The anecdote is represented in, or is coming from Cronin's 1935 novel The Stars Look Down. Alexander, Paul, (2008), Peace to War: Shifting Allegiances in the Assemblies of God. Telford, PA: Cascadia Publishing/Herald Press. A history and analysis of conscientious objection in the Assemblies of God, the largest Pentecostal denomination. Catherine Ryan, Gary Weimberg (2008), "Soldiers of Conscience" [videorecording]; Luna Productions, aired on PBS, profile of 4 US Conscientious Objectors during the Iraq War. Bennett, Scott H. (2003). Radical Pacifism: The War Resisters League and Gandhian Nonviolence in America, 1915-1963. (Syracuse Univ. Press). Quakers in Britain – Conscientious Objectors. Rick Tejada-Flores, Judith Ehrlich (2000), "The good war and those who refused to fight it" [videorecording]; Paradigm Productions in association with the Independent Television Service, aired on PBS. Refusing to Kill: conscientious objection and human rights in World War One. Peace Pledge Union, 2006.